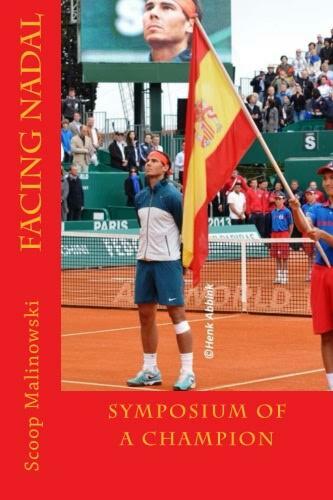 Tennis journalist Mark “Scoop” Malinowski recently published his fourth tennis book, Facing Nadal: Symposium of a Champion. In the book, Malinowski talks to more than 50 ATP players, including greats such as Novak Djokovic and Roger Federer, about what made 14-time Grand Slam champion Rafael Nadal such a tough opponent and what it was like to face him. Malinowski has written about the sport for numerous tennis and national sports publications. His previous tennis books include, Marcelo Rios: The Man We Barely Knew, Facing Hewitt and Facing Federer: Symposium of a Champion. "I think challenges, big challenges that I had in my career changed me in a positive way as a player. Because of Rafa and because of Roger, I am what I am today, you know, in a way, because when I reached number three in the world and won the first Grand Slam title in 2008, the years after that I struggled a lot mentally to overcome the doubts that I had. And all the big matches I lost to these guys, I was consistent, but not winning the big matches, and then they made me understand what I need to do on the court. I worked hard, and it has paid dividends in the last couple of years. “Obviously it's not easy when you're playing a top rival in the finals of any tournament, but if you want to be the best, you have to beat the best. You have to win against the best players in the world. That's the biggest challenge you can have." "I played Nadal when he was a few weeks from being 15 in Mallorca. Boris Becker pulled out of the senior match, so they asked me at the last minute to come in and play the world junior champion, and I said, 'Yeah sure … I don't mind playing. The show must go on.' A bit of entertainment. Obviously, he didn't hit the ball as hard then, but he played with the same intensity, top spin. I was kind of shocked by it all [smiles]. “As a young kid his age, it wasn't as if it was something I couldn't handle but, the crowd was quite amused when he won the first set against me. I was sort of being nice to him … ‘Okay, no more Mr. Nice Guy because this kid is really good. He'll beat me if he can.’ It's not sort of like a fun game. He won the first set and the crowd thought it was hilarious. They were roaring for us. So we were on the court together, and I started chip-charging, serve and volley, that sort of stuff, and won the second set pretty comfortably, 6-2 I think. The 10-point tiebreaker. As I said before, 99 percent of the kids would have choked and fallen apart. He was just tearing it up everywhere, all over the court and hit some unbelievable winners. At the time, I was 38 and was still hitting the ball pretty well. The book talks to many more current and past professional players as they discuss what makes Nadal such a special player. The book is available for purchase on Amazon.com.